My Valentine-for-life is a funny bird. The man is macho. He loves football, guns, archery, digging ditches in our yard, playing screaming electric guitar, building things, winter camping, and going on speed hikes through the woods. He’s an unapologetic geek. True, he’s an engineer and that’s part of the package, but it’s way more than that. Wanna get him chatting? Bring up Medieval history. He talks about those regents like they’re sitting on the throne today. Go on. I dare you to start a discussion on the Stone of Scone. And no, it isn’t a failed baking experiment. I love that guy and his quirkiness. He’s a milk chocolate lover. (To me that’s a quirk, since dark chocolate is the be-all-and-end-all of the chocolate world.) And he’s a coffee guy (where I’m a tea girl.) So when it comes time to create a treat for him that will make him misty-eyed, I usually combine his two favourites in one form or another. 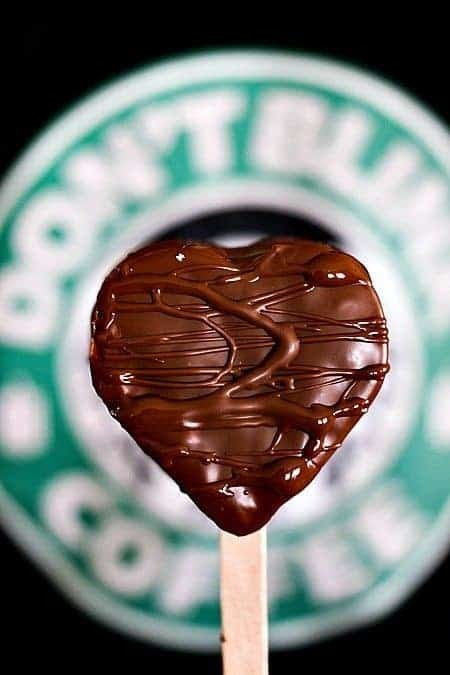 This year, I decided to get mushy on him and make heart-shaped, coffee flavoured, milk chocolate dipped marshmallow pops. Nothing but the best for my sweetheart. Now, you COULD skip making them heart shaped and simply make them rectangles. Likewise, you could skip the stick and just let them be stand alone marshmallows, but I like the stick both for the dipping ease (build in handle!) and the tidier eating process (Look ma, no gooey fingers!). And if you are making these for someone who likes ribbons -unlike my dude- by all means, festoon them with red polka dots or heart covered silky ribbons. Do whatever dings your beloved’s cardiac chimes. 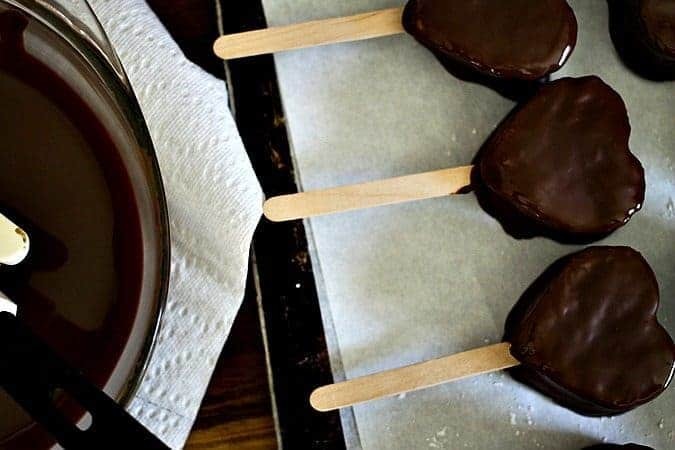 Heart-shaped, airy, coffee flavoured marshmallows enrobed in silky milk chocolate. 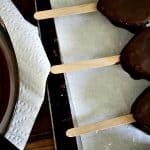 Perfect for Valentine's Day OR a Game Day dessert! Line 9 x 9-inch or 8 x 8-inch pan with plastic wrap and lightly oil it using your fingers or non-stick cooking spray. Set aside. Meanwhile, combine sugar, corn syrup and 1/4 cup water in a small saucepan. Bring the mixture to a rapid boil. As soon as it is boiling, set the timer and allow to boil hard for 1 minute. Carefully pour the boiling syrup into soaked gelatin and turn on the mixer, using the whisk attachment, starting on low and moving up to high speed. Add the salt and beat for between 10 and 12 minutes, or until fluffy and mostly cooled to almost room temperature. After it reaches that stage, add in the extract and beat to incorporate. Grease your hands and a rubber or silicone scraper with neutral oil and transfer marshmallow into the prepared pan. Use your greased hands to press the marshmallow into the pan evenly. Take another piece of lightly oiled plastic wrap and press lightly on top of the marshmallow, creating a seal. Let mixture sit for a few hours, or overnight, until cooled and firmly set. Sprinkle a cutting surface very generously with confectioner’s sugar. Remove marshmallow from the pan and the plastic wrap and lay on top of the sugar. Dust the top generously with sugar as well. 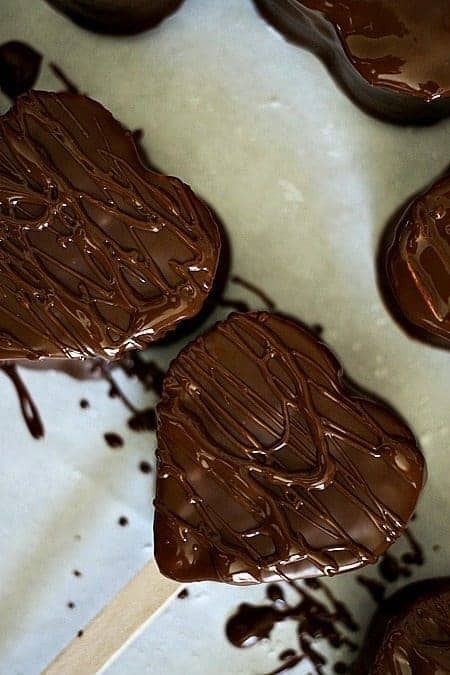 Dip a heart shaped cookie cutter into confectioner's sugar and cut as many hearts as you can from the marshmallow slab. Depending on the size you use, you can get between 4 and12 marshmallows from one slab. I like them best mid-sized and get 9 marshmallows with my cutter. Insert a stick into each marshmallow. Place on a waxed paper or parchment lined cookie sheet. Place the sheet in the freezer for at least 30 minutes, but up to 24 hours before proceeding. Add the milk chocolate chips and coconut oil to a microwave safe dish. Microwave on high for 45 seconds, stir, and return to the microwave in 10 second bursts on high, stirring well after each one, until it is perfectly smooth. Let it stand at room temperature for 5 minutes. 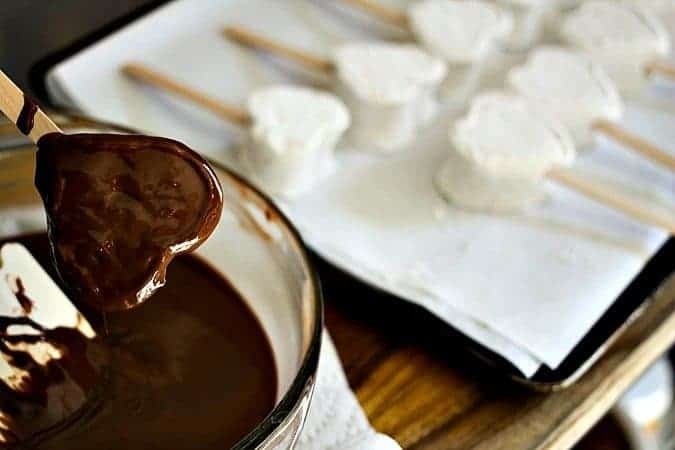 Take the marshmallow pops from the freezer and quickly dip into the melted chocolate, letting excess run off ~OR~ use a spoon to drizzle the melted chocolate artistically over the marshmallow pops. Let them firm up at room temperature. These are good up stored tightly wrapped at room temperature for up to 5 days after being made. Looking for more chocolate recipe inspiration for Valentine’s Day and beyond? 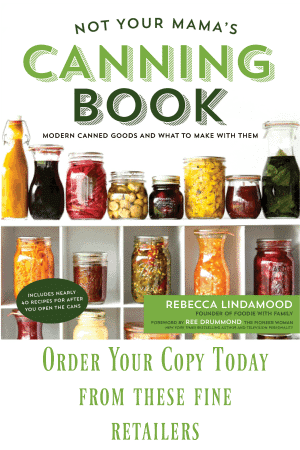 Check out our friends at KraftRecipes.com. Love this- what a sweet sentiment. Sounds like you’ve got quite a catch! Do you mail-order these pops? Cause I’ll take a dozen and for all my loves here. Can’t I just order some? These are so freaking pretty! I love this idea! 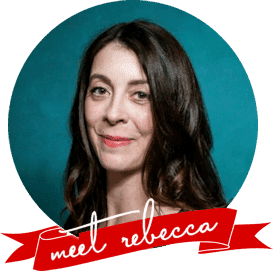 oh dear I’m sorry–my husband mega medieval dork and reenactor–regents? I see your regents and raise you buttonholes on shirts and the proper making of shoe soles!